The camps are operated in four of the premier destinations in Northern Botswana – Xakanaxa, Khwai, Savuti and Chobe Riverfront. You book these Fly Camp safaris like you would book any camp / lodge in Botswana. No set departures either. A minimum of a two-night stay is required. All accommodation with basic en-suite facilities in a comfortable camp set up in private areas. Guests enjoy three meals per day, prepared by the camp cook. Guests fly into the airstrip that is closest to the site and are collected by the operator, saving travelling time – time that will be spent productively viewing game! The Tents have twin beds with linen, side table, lamps and of course en suite (bucket shower and loo). 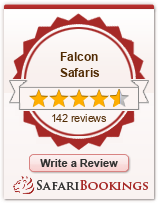 Upon arrival of your flight at OR Tambo Airport you will be met by an Falcon-Safari.com representative who will assist you onto your scheduled flight from Johannesburg to Maun. Upon arrival at Maun Airport you will be met by a Delta Air representative and assisted onto a scheduled light aircraft charter flight to Xakanaxa. You will be transferred to the airstrip in time for your scheduled light aircraft charter flight to Kasane Airport for Chobe Riverfront Fly Camp. You will be transferred to Kasane Airport where you will be met by your driver and transferred to Thorntree River Lodge in Livingstone. The transfer will take approximately two hours and will involve customs and immigration formalities.